The Ethiopian Orthodox Church has maintained a quiet presence in Jerusalem for more than 1,500 years, with some people claiming that there has been an Ethiopian delegacy in the Holy Land ever since the famed meeting of the Queen of Sheba and King Solomon some 3,000 years ago. 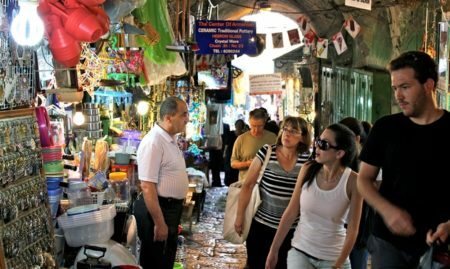 For many centuries, the center of the Ethiopian Church in Jerusalem was a small courtyard with several structures behind the Church of the Holy Sepulcher in the Christian Quarter of the Old City. Today, however, the Church has to a large extent relocated outside the walls to the western city. The move began in the 19th century, when a succession of powerful Ethiopian monarchs decided to establish a strong presence outside Africa. In 1888, Ethiopian Emperor Yohanes bought a large plot of land and began construction of a new church and monastery. The complex eventually lent its name to the road on which it is situated – Ethiopia Street. The new church is an impressive structure in a secluded courtyard, built in the circular style reminiscent of other Ethiopian churches. 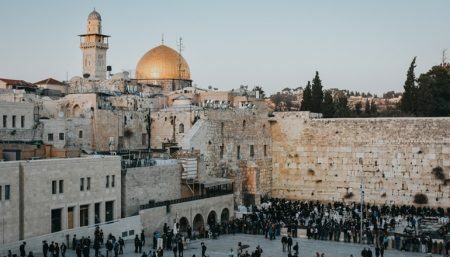 The complex is usually a haven of tranquility in the heart of downtown Jerusalem, but during Easter things pick up, and it is recommended to visit and witness the lively services. Remember to take off your shoes at the entrance as this is a requirement of the Ethiopian rite.